it’s wintertime around here and while there may not be snow on the ground (which is totally unusual for where we live, but i’m not complaining!) there is still a chill in the air, and that can only mean one thing: it’s soup season! i always look forward to this time of year. not only because i get to pull out all my favorite sweaters, but because a pot of delicious smelling soup makes my house smells divine and just warms my soul. all of these soups are easy to put together. soups are great since a lot of them use very few ingredients, you can prep everything ahead of time and then throw it all in a pot less than an hour or so before dinnertime, you can freeze leftovers for a warm meal another day (or another month! ), or you can do what i love to do and make them earlier in the afternoon and just let them simmer away and develop amazing flavor in the slow cooker. and this soup you see right here is the BEST to throw together in a slow cooker! 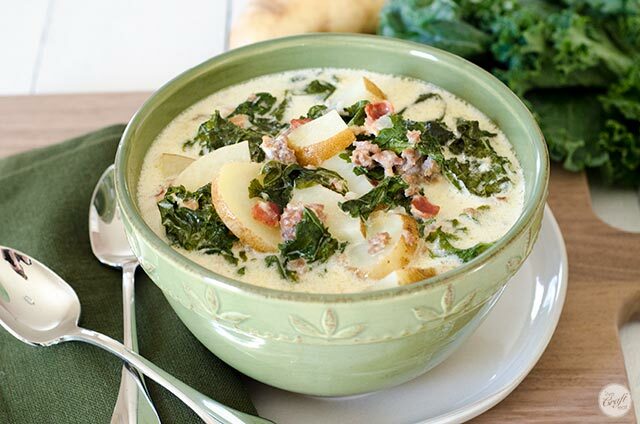 zuppa toscana (tuscan soup) is a favorite for a lot of people from a well-known restaurant (olive garden). the best part is that you don’t have to go to a restaurant to enjoy it! it’s really easy to make at home, but it still tastes like you’re splurging on something really decadent! it’s amazing how just a few simple ingredients can come together to make something that tastes so good. 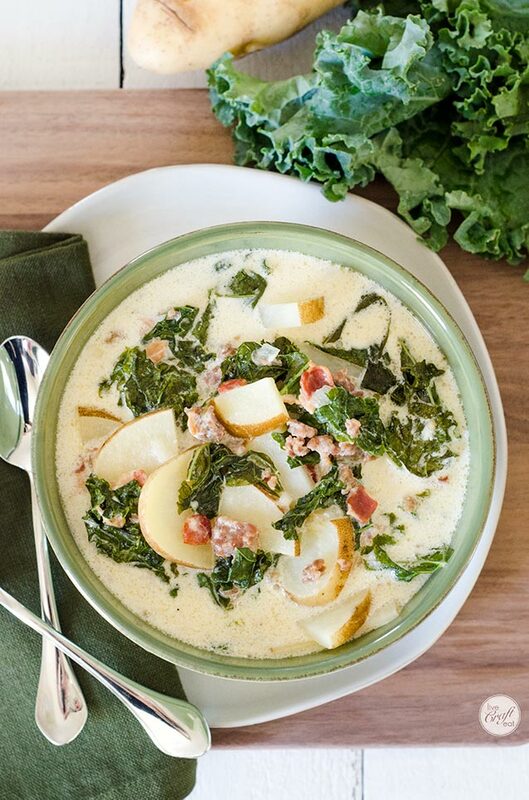 even better since it’s a crock pot zuppa toscana recipe that is ready when you are! 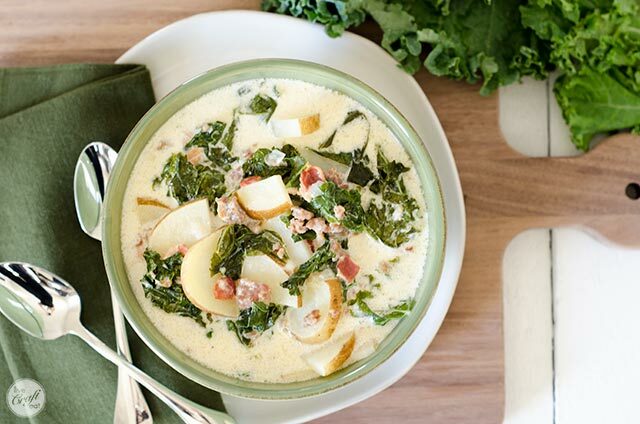 when you combine kale, onion, bacon, italian sausage, and potatoes to chicken broth and cream you’ve got a mouthwatering combination that literally tests my ability to refrain from eating the whole thing! i’m not always able to stop myself though, and i have been known to eat bowl after bowl of this soup because it really is just so heavenly. give it a try just one time and i know you will love it too! i think you should try it on a cold, busy day and see if it checks off all the requirements of being an easy, uncomplicated, satisfying meal that is sure to warm you up before heading off into the cold from one activity to the next OR to warm you up for a cozy night in front of the tv while binge-watching your favorite series. that would be my preference! make sure you print out this crock pot recipe and take it with you next time you go grocery shopping. you’ll want to make sure you’ve got everything you need on hand when the cold weather hits. when snow gets me down, this soup puts a smile right back on my face! put everything except for the kale and potatoes together in a large slow cooker and cook on high for 3-4 hours, or on low for 5-6 hours. add the kale and potatoes for the last 40-60 minutes. if you like this post, please be sure to share it and/or save it for later on facebook and pinterest! Made this for dinner tonight – super, super delicious! My family gobbled it up! My husband commented,”I used to eat this all the time at Olive Garden.” Well, now he can have it any time he likes at home. Thanks for sharing – it’s a family favorite for sure!!! woot! woot! so glad you guys liked it! it’s one of my favs, for sure!